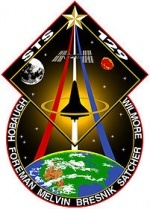 STS-129 (ISS assembly flight ULF3) was the most recent Space Shuttle mission to the International Space Station (ISS). Atlantis was launched on 16 November 2009, at 14:28 EST (UTC -5) and landed at 9:44 a.m. EST on 27 November 2009 on runway 33 at the Kennedy Space Center's Shuttle Landing Facility. STS-129 focused on staging spare components outside the station. The 11-day flight included three spacewalks. The payload bay carried two large ExPRESS Logistics Carriers holding two spare gyroscopes, two nitrogen tank assemblies, two pump modules, an ammonia tank assembly, a spare latching end effector for the station's robotic arm, a spare trailing umbilical system for the Mobile Transporter, and a high-pressure gas tank. STS-129 was the first flight of an ExPRESS Logistics Carrier. The completion of this mission leaves five space shuttle flights remaining until the end of the program.